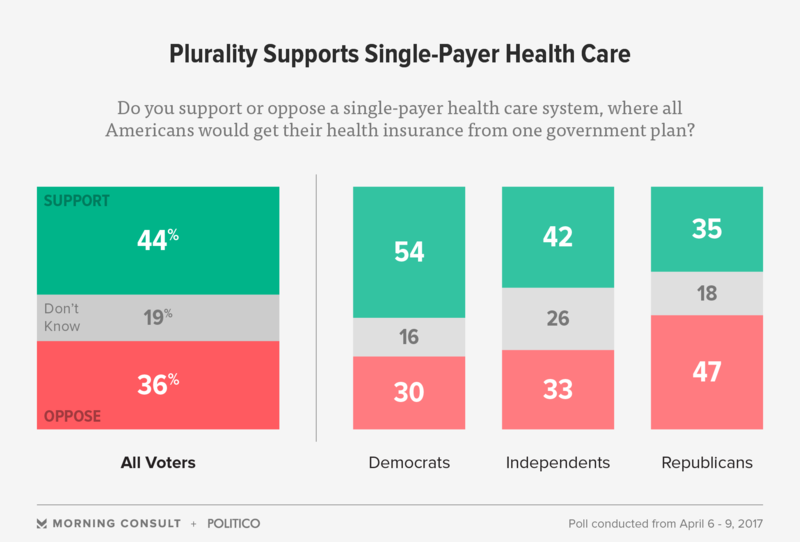 A plurality of voters support the adoption of a single-payer health insurance system in the United States, according to a new Morning Consult/POLITICO poll. Forty-four percent of voters said they support a system where “all Americans would get their health insurance from one government plan,” while 36 percent said they oppose it. Americans who voted for President Donald Trump are split on a single-payer system, a progressive cause that is fiercely opposed by Republicans in Congress. Thirty-seven percent of Trump voters said they support the idea, while 48 percent oppose it. 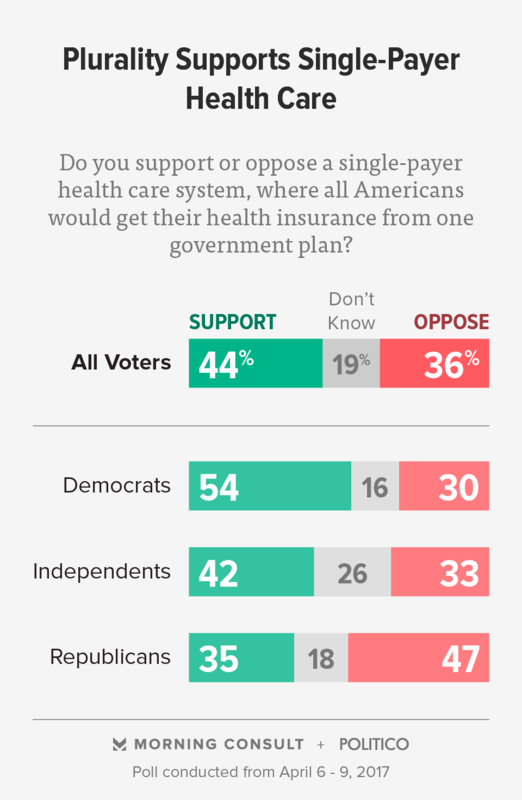 Universal health coverage from the government is backed by more than half of Democrats (54 percent), while independent voters are split on the idea, with 42 percent in favor and 33 percent opposed. A majority of voters also continue to approve of the Affordable Care Act, which has seen an uptick in support as Republicans try to repeal and replace it. Fifty-one percent of voters support the ACA, up 10 points from the beginning of 2017, when the health program’s approval rating sat at 52 percent disapprove and 41 percent approve. Despite the rise in support among the entire electorate, Trump voters are deeply opposed, with 71 percent expressing their disapproval — though that figure is down from 79 percent in early January. GOP voters are divided on whether Republicans in Congress should try to reach a consensus around the American Health Care Act to replace Obamacare, or whether they should start over from scratch. Almost half of Republicans (49 percent) want GOP lawmakers to amend the AHCA, while 42 percent want them to start over with an entirely new health care bill. While GOP voters are split on the Obamacare repeal’s path forward, they overwhelmingly want Republicans in Congress to stick with health care rather than move onto other legislative issues. Seventy-three percent said they should continue to work on the health care overhaul, while only 20 percent said they should shift gears. The online survey was conducted from April 6 to April 9 and consisted of 1,988 registered voters. The national poll has a margin of error of plus or minus 2 percentage points. See more here.